This bike is not another Hightower LT (which is still in production). Dear me no. This is the Santa Cruz Megatower. The email, when it came, was brief, and to the point. Tell nobody, huh? That was easy enough. I looked around my office. My only friend was sitting on the counter. Last name Daniels. First name Jack. I poured a slug and thought a while. “Why the secrecy?” I emailed back. The reply was blunt. Photos cannot convey precisely how windy this step-down was. Charming. But not inaccurate: Gangly. Check. Dumbass. Check. Alone. Check. I drank the whisky and got up. Aching. Old bones. Long rides. The six slugs in me didn’t help. Four of those were whisky. The other two were lead. I rummaged around in the drawer, and took out what I’d need. Pedals. Helmet. Shoes. Gloves. Smith and Wesson. The warehouse was deserted by the time I got there. 1936 straight-six Buicks aren’t noted for their speed. Or their reliability. Which is why I got a cab. I paid the driver, walked through the rain to the warehouse, pulled open the door, and got an eyeful of what waited for me. Blackness. One light. And under it…? Not black, no. Sort of a grey colour. Sleek, though. Long. Lithe. 29er. Big travel. Santa Cruz written on the downtube. I glanced at the top tube. “Megatower” I read aloud. 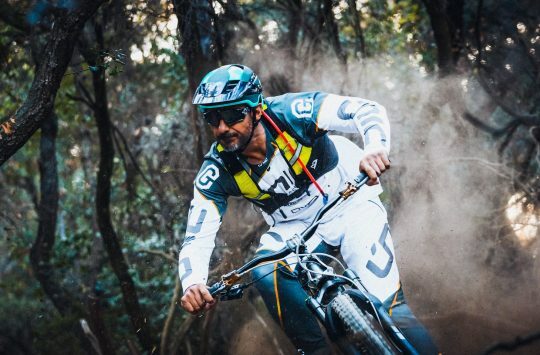 Okay, so by now you’ll no-doubt be aware of the new bike that Santa Cruz is flooding the internet with. 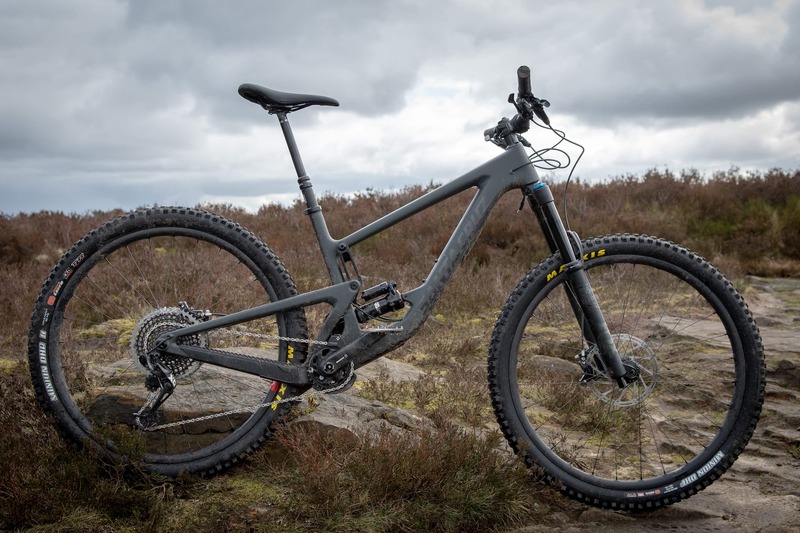 Just as the good folks at SC decided to re-name the replacement/redesign of the Tallboy LT, as it was deemed too different to carry on the same handle (they called it the Hightower), this bike is not another Hightower LT (which is still in production). Dear me no. Doubtless elsewhere on this august website, there will be an entire news story about this new Megatower, with some glorious photos of some radical types styling it up for the camera through a dusty soft-focus lens. But for those new to the whole world of the Megatower, I shall now deliver a précis. This is the the XO1 RSV version of the Megatower – which basically means lots of – er – XO1 all over the place, Fox 36 Performance Elite fork and lots of carbon, including the wheels. It’s very blingy. And it costs £7,699. Zoinks. Nice little flappy mudguard thing (technical term). But the real meat and potatoes is, of course, the frame. Basically, the engineers at Santa Cruz took a long hard look at the suspension systems of the Hightower LT and the Hightower, and shook their heads. They then stared a bit harder at the Nomad and the Bronson, and started looking at each other and nodding enthusiastically. This is, in very crude essence, a Nomad with bigger wheels. 160mm of travel front and back, a tried and tested suspension system, 29in wheels… oh yes, and lots and lots of adjustability. Adjustability, I hear you cry? Why yes, my young padawan. 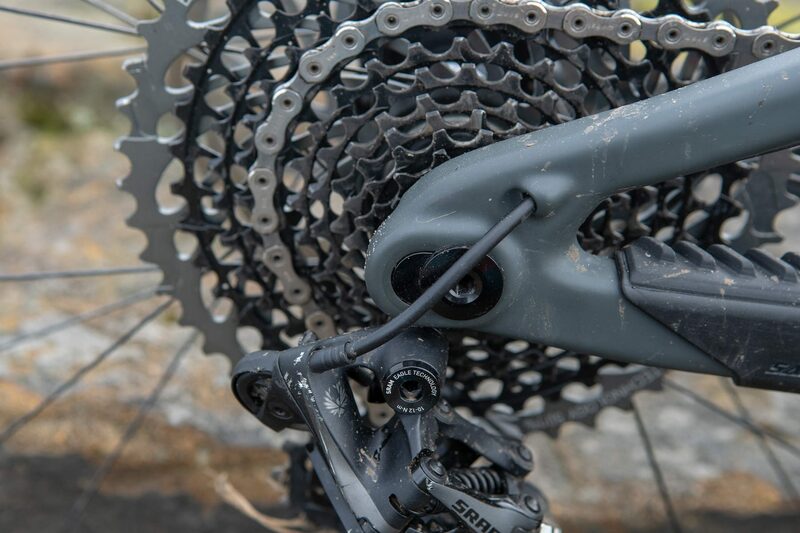 The Megatower is possessed of a number of flip chips; one set in the shock, and another at the rear dropouts. The former set will alter the head angle by 0.3° (um, woo?) 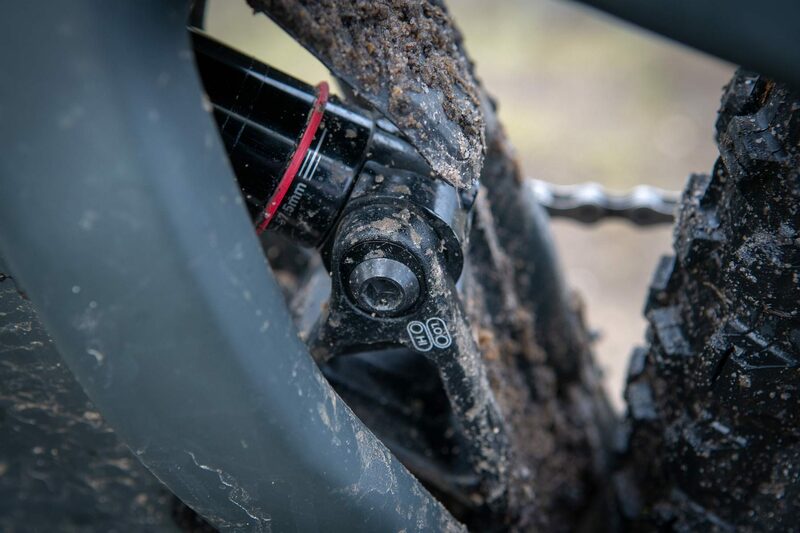 but it’ll also change the bottom bracket height 3.5mm and adjust the suspension leverage curve, which has the potential to substantially affect the handling. …and you can fiddle with it here. 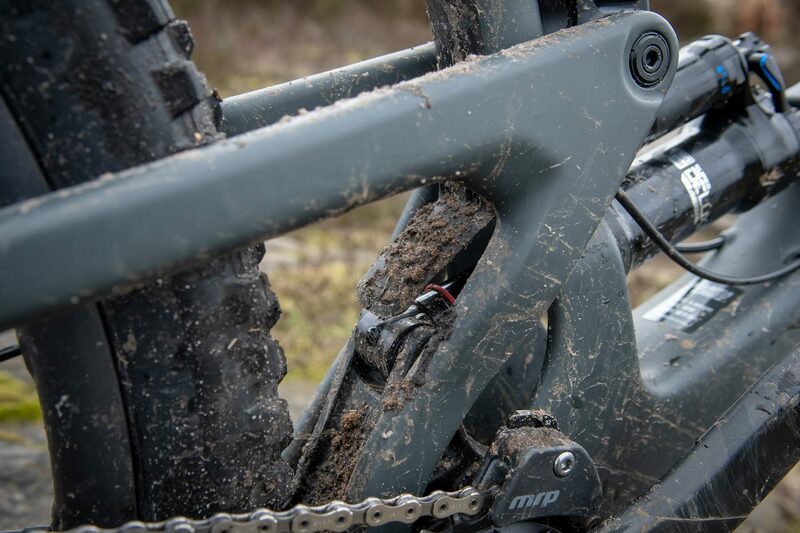 You can also run 170mm forks though, which in the ‘Lo’ position will kick the head angle back closer to a whole degree, while keeping the BB height the same as the ‘Hi’ setting with a 160mm fork. 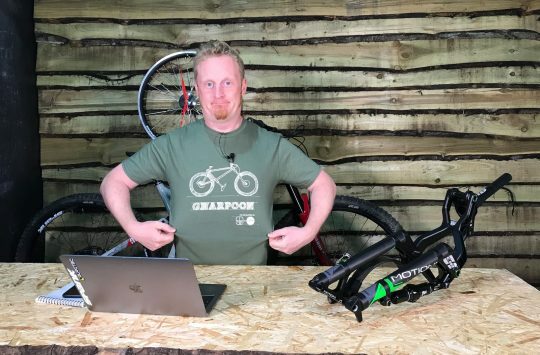 The other pair of chips will alter the rear chainstay length by 10mm, which will affect many aspects of how the bike rides; shorter and livelier or longer with more climbing traction and straight line stability (also probably better for biggerererer people). The chainstay chips also come with new rear mech hangers and brake mounts so everything works tickety-boo, although you do need to run at least 200mm rotors with the longer stays (shorter stays will also accommodate 180mm rotors if you like). 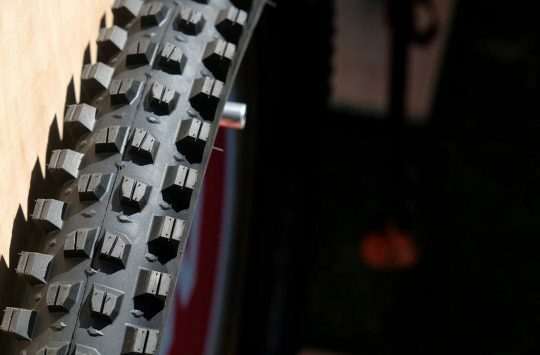 Santa Cruz claims it’ll also run 29×2.6 tyres in the longer setup – which is plenty hefty. 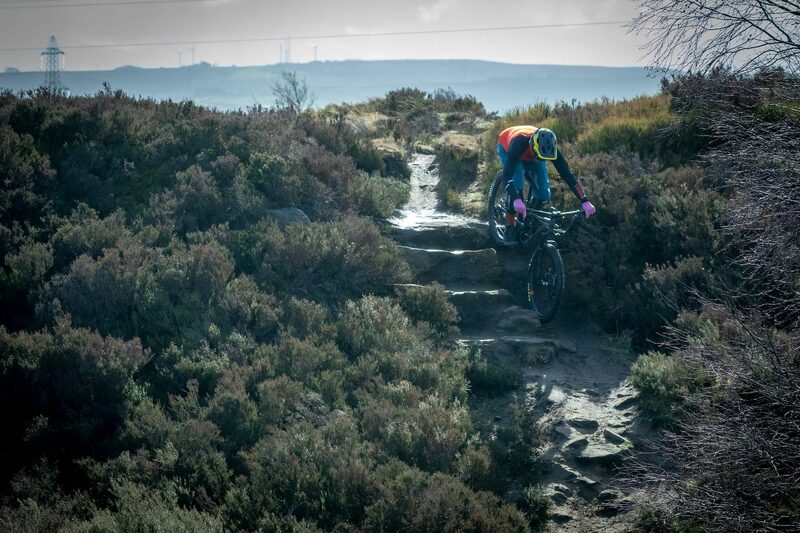 That Nomad/Bronson/V10-esque (try saying that after two slugs of whisky) suspension system is alleged to be nice and linear, with good small bump compliance and a nifty ramp at the end of the travel to resist bottoming out. 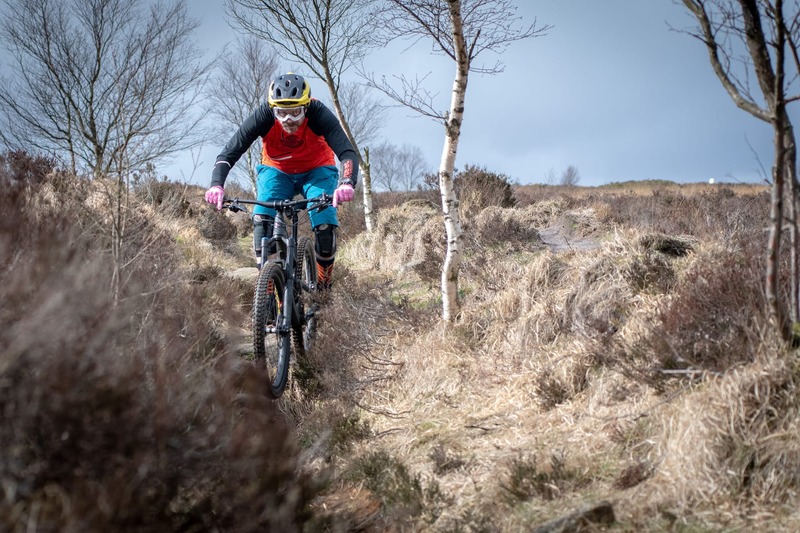 The shock is something new and very spangly (a Super Deluxe Ultimate, it says here) from RockShox that hasn’t even been launched yet as far as I know, so it’s possible that this story might even have me dragged out into the street and shot by mysterious men in brightly coloured 4x4s. Nevertheless, I’ve ridden it. Bwahahahahahahahaha! The rest of the bike has been tweaked to provide a Thoroughly Modern Millie. Ahem, Megatower. No, it won’t win any awards for ‘most slackerer, or longest’ or anything, but it’s up there. Reach on the Large bike I rode is 470mm; it’s blessed with a 65° head angle and a 76.6° seat angle. Not mould breaking, but perfectly acceptable. The geometry isn’t necessarily mould breaking on the Megatower. 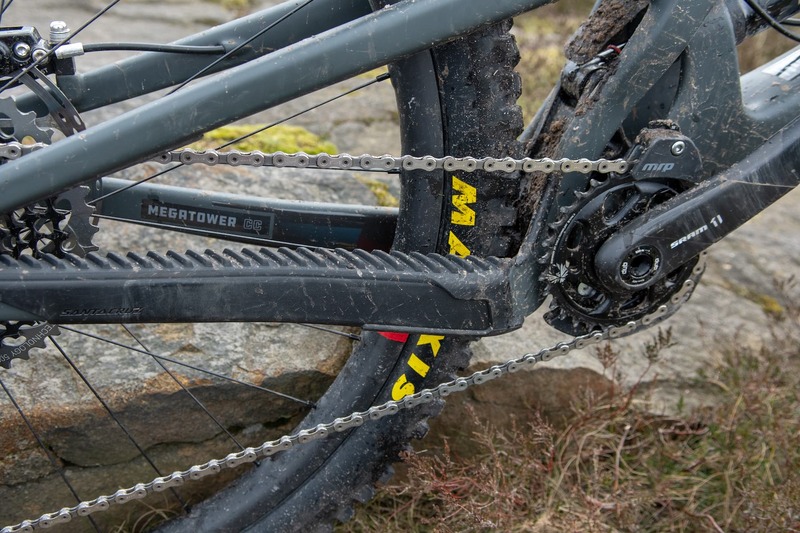 All Hail The Megatower - Santa Cruz' Brand New Long Travel 29er Enduro Bike! Maxtorque – depends how your on point your hamster control techniques are. Jakester – those are the people for whom I wrote the rest of the article. Should my oversized hamster go on some sort of diet? I’d hate if his mates started calling him “fatty” behind his back??? “suspension system is alleged to be nice and linear, with good small bump compliance and a nifty ramp at the end of the travel” So, it’s linear and non-linear?? Sweet Jesus!